Founded in 1995, the Quebec Community Groups Network (QCGN) is a not-for-profit organization linking more than 50 English-language community organizations across Quebec. As a centre of evidence-based expertise and collective action, the QCGN identifies, explores and addresses strategic issues affecting the development and vitality of the English-speaking community of Quebec and encourages dialogue and collaboration among its member organizations, individuals, community groups, institutions and leaders. English-speaking Quebec is a diverse, confident, recognized and respected national linguistic minority that actively participates in and contributes to the social, economic, cultural and political life of Quebec and Canadian society.  The QCGN is a centre of evidence-based expertise and collective action on the strategic issues affecting the development and vitality of English-speaking Quebec. Assists federal, provincial and other levels of governments to commit to legislative policy and financial investments which support the strategic development of English-speaking Quebec. Ensures English-speaking Quebec’s voice as a national linguistic minority in Canada. Identifies common development issues and priorities for action, and supports the development of emerging sectors. Develops and promotes identification with and attachment to the institutions of the English-speaking community. Encourages English-speaking Quebecers to participate in public dialogues around critical societal issues. Develops expertise and capacity to effectively address strategic issues affecting the vitality of the community. Shares knowledge and information widely within the membership. Recruits members from areas and sectors not currently represented within the Network. The need for organizations and groups to work co-operatively, providing mutual support and developing a community of practice. A number of strategies were also proposed to guide the work of the Network. In 2013-2014, the Board of Directors asked the Governance Committee to draft a Statement of Principles that laid out the philosophy and tenets of the organization. It was felt that a clear enunciation of ethical principles would help organizations decide if they wished to join the Quebec Community Groups Network and assist the Network to act collectively within a framework of shared values. Following an organizational reflection, the Statement of Principles was adopted by the membership at its Annual General Meeting in June 2015. The Quebec Community Groups Network traces its roots back to 1994 when the 15 Quebec-based regional and sectoral organizations that were funded under the federal Official Language Communities Program were brought together by Canadian Heritage to better manage program and funding priorities. A year later, that ad-hoc group founded the Quebec Community Groups Network. By the turn of the second millennium, the QCGN had grown to 19 members that banded together to accomplish collectively what individual member organizations could not do on their own. The Network received its first operational budget from the federal government allowing it to establish an office in the provincial capital in 2000. In 2005, following consultations throughout the province, the QCGN launched a Community Development Plan with strategies to revitalize English-minority language communities around seven sectors including Arts and Culture, Education and Training, Employment, Health and Social Services, Media, Youth, and Visibility and Leadership. In 2006, the QCGN was recognized by the Government of Canada and the Department of Canadian Heritage as the official representative and interlocutor of Quebec’s English-speaking community – one of Canada’s two national linguistic minority communities. At that time, the QCGN broadened its membership and adopted a new governance structure with a representative board. In 2007, our headquarters moved to Montreal. In 2009, the QCGN launched celebrations for its 15th anniversary concurrently with the 40th anniversary of the Official Languages Act. The Network inaugurated the Sheila and Victor Goldbloom Distinguished Community Service Award to recognize individuals who have made significant contributions to strengthening the English-speaking community and to building bridges of understanding between Quebecers of different backgrounds. In 2011-2012, the QCGN oversaw the creation of a new Community Development Plan following province-wide consultations that culminated with the Community Priority Setting Conference in March 2012. At the conference more than 150 representatives of community sector organizations from across all regions and all sectors of English-speaking Quebec adopted a Declaration of Community Priorities validating the high level priorities of the community. In 2015, the QCGN celebrated its 20th anniversary. Since then, the Network had grown to 53 member organizations that play a pivotal role in promoting the vitality of English-speaking Quebec and its communities.